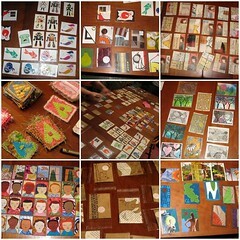 Boston Handmade had an Artist Trading Card swap/potluck dinner on Saturday night. Eight of us made cards. There were an amazing variety of techniques- paper collage, photo collage, fabric applique, drawing, painting... wow! Those of us who have collections already were able to show them off. What a fun evening- delicious food, great company, a studio tour, and then the main event! The cards were laid out on my dining room table. We then made the rounds, choosing one from each pile- it so hard to make a decision!